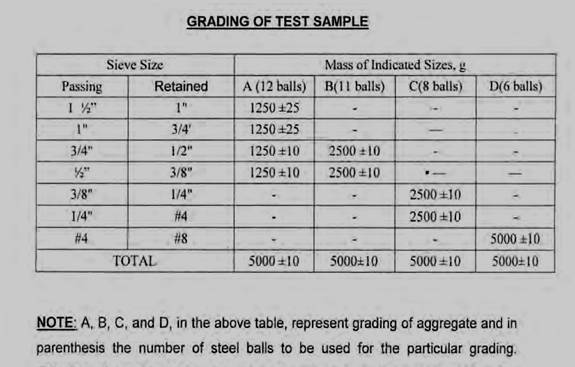 The Los Angeles test is a measure of degradation of mineral aggregates of standard gradings resulting from a combination of actions including abrasion or attrition, impact, and grinding in a rotating steel drum containing a specified number of steel spheres. 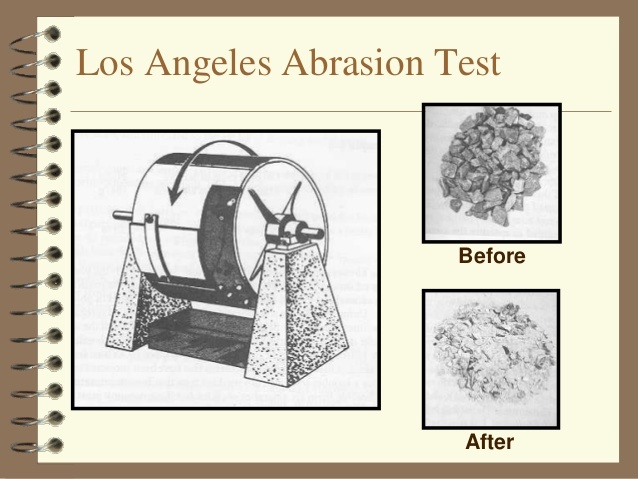 The Los Angeles (L.A.) abrasion test is a common test method used to indicate aggregate toughness and abrasion characteristics. Aggregate abrasion characteristics are important because the constituent aggregate in HMA must resist crushing, degradation and disintegration in order to produce a high quality HMA. Aggregate used in highway pavement should be hard and must resist wear due to the loading from compaction equipment, the polishing effect of traffic and the internal abrasion effect. The road aggregate should be hard enough to resist the abrasion of aggregate. Resistance to abrasion is determined in laboratory by loss angles abrasion test. To produce the abrasive action by use of standard steel balls which when mixed with the aggregate and rotated in a drum for specific number of revolution cause impact on aggregate. 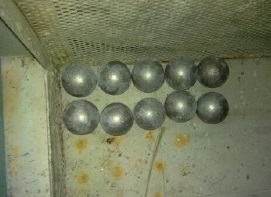 The %age wear due to rubbing with steel balls is determined and is known as abrasion value. Prepare the sample by the portion of an aggregate sample retained on the 1.70 mm (No. 12) sieve and place in a large rotating drum that contains a shelf plate attached to the outer wall. Prepared sample is placed in the abrasion-testing machine. A specified number of steel spheres are then placed in the machine and the drum is rotated for 500 revolutions at a speed of 30 - 33 revolutions per minute (RPM). The material is then separated into material passing the 1.70 mm (No. 12) sieve and material retained on the 1.70 mm (No. 12) sieve. Dry the sample in an oven. 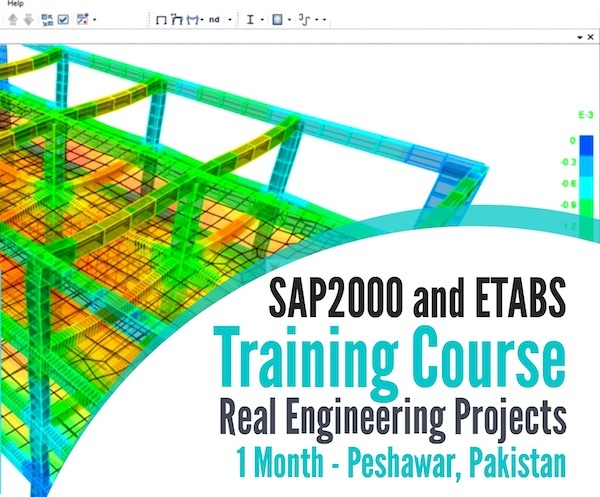 Calculate %age loss due to Abrasion by calculating the difference between the retained material (larger particles) compared to the original sample weight. The difference in weight is reported as a percent of the original weight and called the "percent loss". Sample shall be washed and oven-dried at a temperature of 105°C - 110°C and should conform to one of the grading in observation. 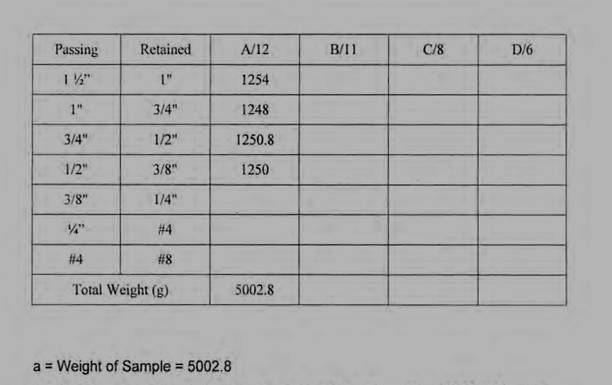 The L.A. Abrasion test is an empirical test; it is not directly related to field performance of aggregates. Field observations generally do not show a good relationship between L.A. abrasion values and field performance. L.A. abrasion loss is unable to predict field performance. Specifically, the test may not be satisfactory for some types of aggregates. Some aggregates, such as slag and some limestones, tend to have high LA. abrasion loss but perform adequately in the field. L.A. abrasion loss seems to be reasonable well correlated with dust formation during handling and HMA production in that aggregates with higher LA. abrasion loss values typically generate more of dust. For an aggregate to perform satisfactory in pavement, it must be sufficiently hard to resist the abrasive effect of traffic over long period of time. The soft aggregates will be quickly ground to dust, whilst the hard aggregates are quite resistant to crushing effect. The test also will determine the quality of the aggregate. The L.A. Abrasion test is widely used as an indicator of the relative quality or competence of mineral aggregates. What is Plaster of Paris and How to Make it at Home?